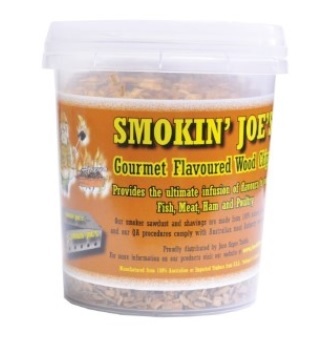 Smoking Joe's Gourmet Flavoured Wood Chips are manufactured to the highest standard and provide the ultimate infusion of flavours to your fish, eat, ham and poultry. Manufactured from 100% Australian or timbers from the U.S.A, and packed in a resealable container to retain flavour and freshness. Available in: American Bourbon, Oak Red Wine, Hickory, Tasmanian Oak, Mountain Ash, Apple, Mallee Root, Rum, and Coffee.